1.1 1949: Abarth & C.
1.3 2007: Rebirth of Abarth & C. S.p.a.
Carlo Abarth was sporting director of the Cisitalia factory racing team starting in 1947. 1948 saw the financial downfall of Cisitalia, spurred by the investments needed to put the 202 coupé into production. The following year the manufacturer folded, and founder Piero Dusio flew to Argentina. Carlo Abarth, funded by Armando Scagliarini,[a] took over Cisitalia's assets and on 31 March 1949 Abarth & C. was founded in Bologna. Carlo's astrological sign, Scorpio, was chosen as the company logo. From the Cisitalia liquidation Abarth obtained five 204 sports cars (two complete Spiders and three unfinished), a D46 single seater and various spares. The 204s were immediately rechristened Abarth 204 A. Abarth built and raced sports cars developed from the last Cisitalia cars. In addition to Guido Scagliarini, the "Squadra Abarth" racing team lined up celebrated drivers including Tazio Nuvolari, Franco Cortese and Piero Taruffi. Notably Tazio Nuvolari made his last appearance in racing at the wheel of an Abarth 204 A, winning its class in the Palermo–Monte Pellegrino hillclimb on 10 April 1950. Alongside racing, the company's main activity was producing and selling accessories and performance parts for Fiat, Lancia, Cisitalia and Simca cars, like inlet manifolds and silencers. 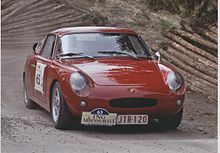 In the 1960s, Abarth was successful in hillclimbing and sports car racing, mainly in classes from 850 cc to 2000 cc, competing with Porsche 904 and Ferrari Dino. Hans Herrmann was a factory driver from 1962 until 1965, winning the 500 km Nürburgring in 1963 with Teddy Pilette. Abarth promised Johann Abt that he could race a factory car free if he won all the races he entered.[when?] Abt almost succeeded: of the 30 races he entered, Abt won 29 and finished second once.[when?] Abt later founded Abt Sportsline. Abarth produced high-performance exhaust pipes, diversifying into tuning kits for road vehicles, mainly for Fiat. A racing exhaust was produced for the 1950s Lambretta models "D" and "LD". Original Abarth LD exhausts are now valuable collectors' items. Reproductions are available which carry the Abarth name, how Fiat feels about this is not known. Lambretta even held several 125 cc motorcycle land speed records during the 1950s thanks partly to the exhaust that Abarth developed for them. Under Fiat ownership, Abarth became the Fiat Group's racing department, managed by engine designer Aurelio Lampredi. 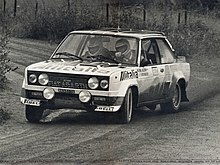 Abarth prepared Fiat's rally cars, including the Fiat 124 Abarth Rally and 131 Abarth. In December 1977, in advance of the 1978 racing season, the beforehand competing Abarth and Squadra Corse Lancia factory racing operations were merged by Fiat into a single entity named EASA (Ente per l'Attività Sportiva Automobilistica, Organization for Car Sports Racing Activities). Cesare Fiorio (previously in charge of the Lancia rally team) was appointed director, while Daniele Audetto was sporting director; the EASA headquarters were set up in Abarth's Corso Marche (Turin) offices. The combined racing department developed the Lancia Beta Montecarlo Turbo Group 5 racing car which won the 1980 World Championship for Makes and the 1981 World Endurance Championship of Makes. It also created the Lancia Rally 037 Group B rally car which won for Lancia the 1983 World Manufacturers' Championship). In the 1980s, Abarth name was mainly used to mark performance cars, such as the Fiat Ritmo Abarth 125/130 TC. On 1 February 2007 Abarth was re-established as an independent unit with the launch of the current company, Abarth & C. S.p.a., controlled 100% by Fiat Group Automobiles S.p.A., the subsidiary of Fiat S.p.A. dealing with the production and selling of passenger cars and light commercial vehicles. The first model launched was the Abarth Grande Punto and the Abarth Grande Punto S2000. The brand is based in the Officine 83, part of the old Mirafiori engineering plant. The CEO as of 2011 is Harald Wester. In 2015, Abarth's parent company was renamed FCA Italy S.p.A., reflecting the incorporation of Fiat S.p.A. into Fiat Chrysler Automobiles that took place in the previous months. ^ "Alfredo Altavilla - FCA Group". www.fcagroup.com. Retrieved 22 March 2018. ^ "Abarth wants 100 dealers in Europe". autonews.com. Retrieved 7 January 2008. ^ "Abarth Logo: Design and History". Famouslogos.net. Retrieved 28 July 2011. ^ a b c Boscarelli, Lorenzo. Abarth: le corse. Abarth: l'uomo e le sue auto; Fiorenzuola d'Arda, 9 May 2010. Monografie AISA (in Italian). 90. Associazione Italiana per la Storia dell'Automobile. pp. 3–25. Archived from the original (PDF) on 13 February 2015. ^ Avidano, Renzo. Carlo Abarth - Il compendio di una vita per le auto e le corse. Abarth: l'uomo e le sue auto; Fiorenzuola d'Arda, 9 May 2010. Monografie AISA (in Italian). 90. Associazione Italiana per la Storia dell'Automobile. pp. 29–32. Archived from the original (PDF) on 13 February 2015. ^ a b "Karl Abarth, the man and his history". bernimotori.com. Retrieved 28 May 2014. ^ "Quando venne a Torino per la sua ultima gara". Stampa Sera. 13 August 1953. p. 5. Retrieved 12 February 2015. ^ "Le attrattive del Salone". Stampa Sera. 12 April 1951. p. 2. Retrieved 12 February 2015. 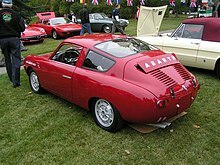 ^ "1952 Abarth 1500 Biposto Coupé". rickcarey.com. Archived from the original on 21 July 2011. Retrieved 28 July 2011. ^ a b c d e f "The history of Abarth". abarthcarsuk.com. Archived from the original on 29 May 2014. Retrieved 28 May 2014. ^ "125 Model D Racer". racinglambrettas.com. Retrieved 22 June 2014. ^ "Lambretta World Land Speed Record Scooter". lambrettista.net. 7 October 2013. Retrieved 22 June 2014. ^ "Porsche 356B Carrera GTL Abarth". porschearchive.com. Retrieved 28 May 2014. ^ "L'Abarth entra nel gruppo Fiat". La Stampa. 16 October 1971. p. 17. Retrieved 13 March 2015. ^ Avidano, Renzo. I rapporti con la Fiat. Abarth: l'uomo e le sue auto; Fiorenzuola d'Arda, 9 May 2010. Monografie AISA (in Italian). 90. Associazione Italiana per la Storia dell'Automobile. pp. 33–35. Archived from the original (PDF) on 13 February 2015. ^ a b Fenu, Michele (6 December 1977). "Rally, Fiat e Lancia si uniscono in un nuovo "super-squadrone"". La Stampa. p. 17. Retrieved 13 March 2015. ^ Borgomeo, Vincenzo (23 January 2007). "Svolta Fiat: torna l'Abarth e diventa marchio indipendente". La Repubblica (in Italian). Retrieved 7 September 2014. ^ "Nominato il nuovo CEO di Abarth" (in Italian). ^ "XSR900 Abarth". Yamaha. Retrieved 5 December 2016. ^ "The Abarth Monomille". scuderialafortuna.blogspot.com. Retrieved 22 January 2008. Wikimedia Commons has media related to Abarth vehicles. This page was last edited on 7 March 2019, at 10:15 (UTC).